The Checklist Manifesto: How to Get Things Right is a 2009 non-fiction book by Atul Gawande. The book was released on Dec 2009 and was a New York Times Best Seller. In the book, Atul (who is a surgeon by trade) talks about how many industries across the world use checklists to “get things done right”. He also breaks down his journey as the one of the key champions that brought checklists into hospitals around the world. This endeavor had incredible results. Below is a quote from a post in the New Yorker that talks about the rollout of checklists in just one state, Michigan. In December, 2006, the Keystone Initiative published its findings in a landmark article in The New England Journal of Medicine. Within the first three months of the project, the infection rate in Michigan’s I.C.U.s decreased by sixty-six per cent. The typical I.C.U.—including the ones at Sinai-Grace Hospital—cut its quarterly infection rate to zero. Michigan’s infection rates fell so low that its average I.C.U. outperformed ninety per cent of I.C.U.s nationwide. In the Keystone Initiative’s first eighteen months, the hospitals saved an estimated $175,000,000 in costs and more than 1,500 lives. The successes have been sustained for almost four years—all because of a stupid little checklist. The short of the matter is, checklists work. I have written about the power of checklists before when I told the story of how a checklist won World War II. 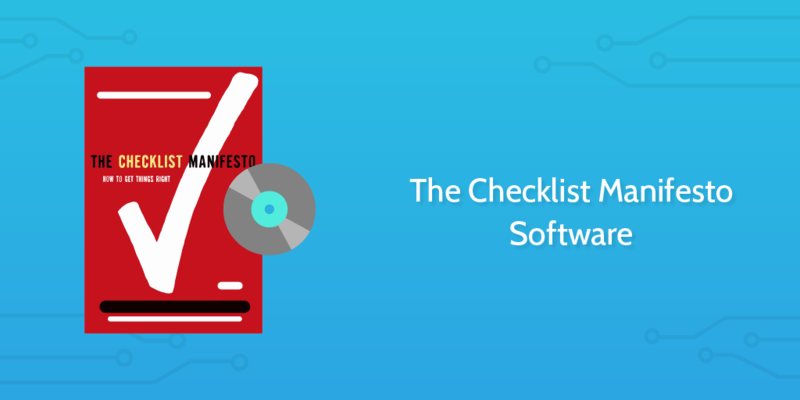 But in today’s day and age, it seems silly to be relying on paper checklists, it only makes sense that as technology evolves we evolve with it. We have built a product called Process Street that understands and embodies the power of checklists. Our software is beautiful, intuitive and easy to use and has a lot more power under the hood than you may expect. But the truth is, when we were first building Process Street I had not read The Checklist Manifesto. It was purely a product I was building to solve my own needs. Only once we had launched, one of our users suggested that I take a look at the book and I instantly fell in love with Atul’s teachings. Process Street is the simplest, most powerful way to manage recurring checklists for your business, team, family or just yourself. If you don’t want to read more and just want to jump in and test it out yourself, you can sign up for a free account here. Keep reading if you want the details. The core of Process Street revolves around a master “template“. A template is what we use to initiate checklist runs and is how we define our process. Examples of common business templates include “New Client Setup“, “New Employee On Boarding“, “Website Launch Checklist” or “Building Inspection”. For personal stuff, check out our “Travel Checklist” and “Wedding Checklist“. A template consists of a lists of tasks (the checklist items) and a content area associated with each task. Each task can have an entire document or “Standard Operating Procedure Manual” hidden behind it so you can give a full explanation and breakdown of how to complete a task. This could include written instructions, bullets, links, images, videos and files. Once you have designed a checklist, you can run it multiple times as different instances. For example, if you had created a template called “New Client Setup” you could run the checklist for every new client. You could name the checklist the client name “Apple”, “Google”, “Microsoft” and concurrently work through the different checklists at varying paces. Once a checklist is completed (or not) you can archive it away and keep it as a reference. You can easily track the progress of the various checklists you are running from the dashboard. Here you can browse the various processes you are running and see at a snapshot the active checklists, who is working on them, due-dates, comments, and progress. You can also open up a checklist and see a detailed activity feed which will show you exactly when and who checked, commented or completed a checklist. 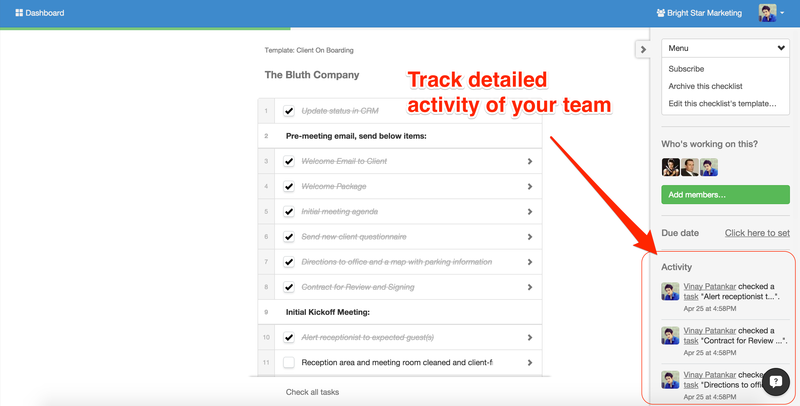 You can invite your team to work on checklists, have conversations around different items or attach files as needed. You can also invite guests to work on checklists, even if they are not part of your team. Guests will only see the specific checklist they are invited to and nothing else in your organization. There is a lot more to Process Street than initially meets the eye. What seems like simple checklist software can actually become a powerful tool for managing workflows in your business. For a full overview of the advanced features, take a look at our user guide. To try it yourself, sign up for a free account with Process Street.